Ultra Telescopic square is a aluminum parasol with 8 ribs which can be produced for Cafes and Restaurants. All plastic parts in the frame 2 year warranty aganist Brekage, used in production row materials same as all over the world, which are manufactured from ABS and POLYAMID PA6 Prime. Mechanics; the gearbox and spindle contained in the centre of pole be operated by a crank. Opening and closing by hand crank. Telescopic opening system that allows an easy closing of the parasol without moving the furniture. Anodized or another colours can be coated. 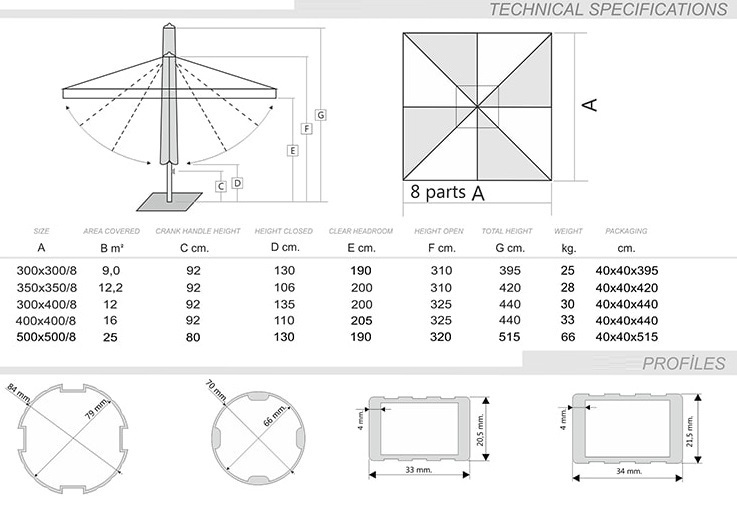 Parasol centre pole is 84 mm diameter. All the screws of the frame are stainless. The wind can be evacuated by air window in the top of the parasol and it has a dual roof. You can use safety your parasol in the windly weather. 250 gr Olefin (5 year warranty) and 300 gr acyrlic fabric protect you from the sun for years.